2016: Obama's America Starts Today! As I recently wrote, “progressives” in America today seek to supplant the Constitution. They reason that something devised in such a different time could not possibly be adequate in such a fast-moving, industrialized, technological age. They contend that the checks and balances built into it are too restrictive and cause the wheels of government to grind too slowly. As such, it cannot be responsive enough to the needs of the nation as they arise. Their remedy to this so-called problem is the administrative state, i.e., bureaucracies. By placing the practical, day to day administration of government in the purview of various departments, it separates the workings of government from the messy political process and leaves it unencumbered by those bothersome checks and balances. That’s their theory. While we would all like to see a more efficient and responsive government, the progressives approach is will not work. The fatal flaw of their plan is their upside down view of human nature which leads them to believe that unelected, unaccountable human beings can be trusted with that kind of power and money. The Founders labored under no such delusions. In fact, their understanding of the flawed nature of human beings is the very reason they built the checks and balances into the system, and the primary reason it worked so well for so long. Without question there has been more human progress in the 200 plus years since America came into being than in all recorded history up to that time put together. This is no coincidence. It is directly attributable to the Founders and the Constitution they devised. How ironic that the very Constitution today’s “progressives” so lament facilitated all that amazing progress! The actions of progressives today are stifling economic and societal progress. If they are not stopped, and soon, they will soon and quickly “progress” us irrevocably back to the dark ages. The best and quite probably last opportunity to do that will be November 6, 2012. Remember that when you go to the polls. Sept. 28 – Nov. 6 ending just before the election. America is in a tremendous geo-political and economic crisis. We are headed in the wrong direction. We must return to the God of our fathers. Please join with Christians across our nation to faithfully pray for the United States of America. 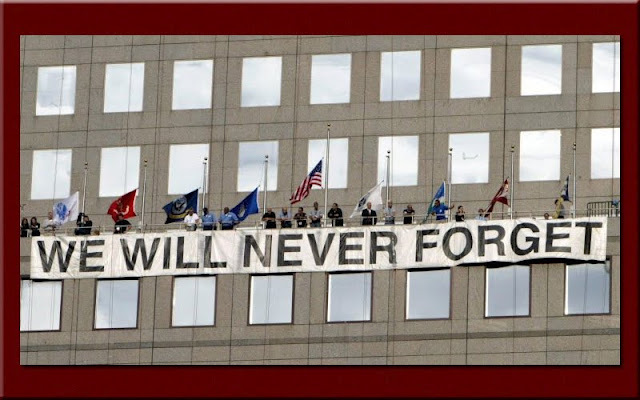 There are several online sites posting daily prayers. Christian Cyber Ministries has an email list to join for their "USA Election Prayer Count Down"
These are just a few of the ministries and options to join across America to pray together. [T]he stakes for our beloved country could not be higher. We all want to do all that we can, so I would like to encourage every one who is a Christian to prayerfully consider fasting and praying to God for mercy on our nation during these final 40 days. Then, on November 6th, we'll have our answer. 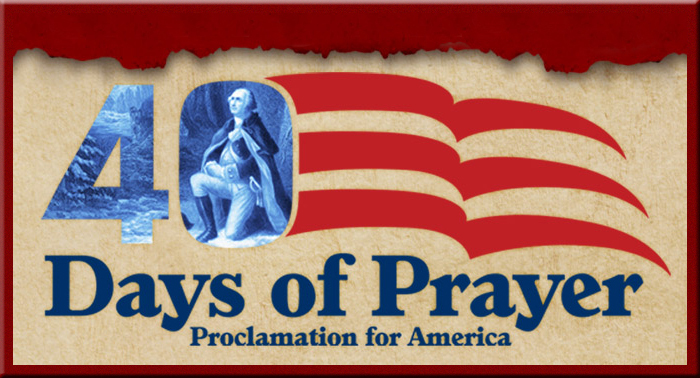 Comments are open to share prayer and additional ministries joining the 40 Days of Prayer for America. In II Samuel 12, we read of God telling David through the prophet Nathan that, as a result of David's sin, the baby conceived through David's liaison with Bathsheba, would die. David's response was to fast and cry out to God to spare the boy. His reasoning was that, as long as the boy was still alive, there was a chance that God might change His mind and he resolved to do everything he could until the outcome was known for sure. It did not end for David as he had hoped, because the boy finally died. When he found out, though, he got up, washed, ate and went on with life. Our nation is under a curse and deserves to be judged for our sins against God. But, until we know His verdict for sure, we, His people, must do all that we can to beg His forgiveness and mercy. 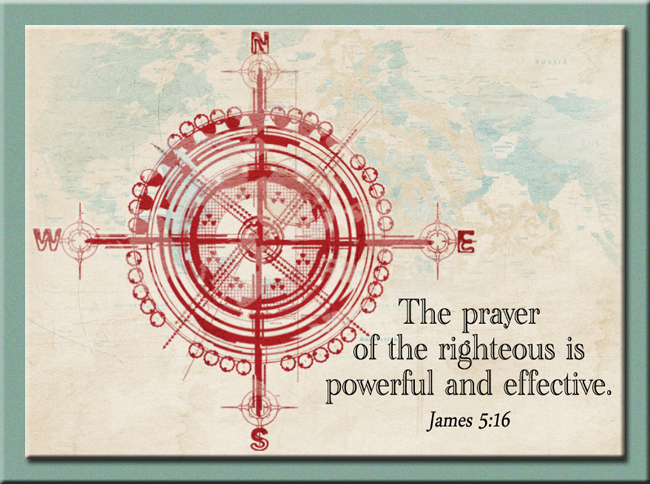 Fasting and prayer are the most effective and earnest ways we can do so. September 27 through November 5 are the final 40 days before the election. The home stretch, if you will. The outcome is very much in doubt and the stakes for our beloved country could not be higher. We all want to do all that we can, so I would like to encourage every one who is a Christian to prayerfully consider fasting and praying to God for mercy on our nation during these final 40 days. Then, on November 6th, we'll have our answer. Below is a copy of an article I wrote and have submitted to several local publications, asking that they publish it. I don't know if they will or not but, if you think it worthwhile, please forward it to your friends, neighbors and any local publications you might know of. Thanks. 4 years ago Barak Obama ran for president vowing to fundamentally transform America if elected. Neither the media nor a euphoric electorate cared to ask what that meant at the time. Perhaps we’re ready to do so now. The Founding generation so believed in these principles that they fought a war with the superpower of the day in order to be free to live them out. Having won that war, they then sought to codify the principles of the Declaration into a working form of government. The result of those efforts, The United States Constitution, then became the “supreme law of the land”, (see Article VI), and unprecedented freedom and prosperity have been the result. So back to Obama, why would he want to change that? It is because he is a “progressive”. That’s a nice sounding word but, what does it mean? Progressivism originated in America in the late 19th century and has as its organizing idea the belief that the Constitution of the United States is not adequate as a governing authority for a modern and “progressive” nation. Progressives, therefore, want to see the Constitution effectively repealed and replaced. So if Obama and his fellow progressives have their way, America will be transformed from a constitutional republic based on principles.That begs the question, what would she be transformed into? Inasmuch as nature abhors a vacuum, something would have to fill the void. What would that be? We don’t have to guess about that either. In all the history of the whole world the only governing authority under which people have been able to live in freedom and enjoy virtually unlimited prosperity is the United States Constitution. Every other form of government ever proposed or practiced has ultimately been some form of tyranny. In November, if We The People vote to re-elect Barak Obama and/or his fellow progressives, by 2016 the progressive’s dreams will have come true because the Constitution will be toast and America will have been irrevocably and fundamentally transformed forever. Progressives believe they can make the world a better place by making government all-powerful. They are wrong. And that is not just an opinion. It is a fact. Now you know! Thank you Macon Cinema for bringing this movie to Macon County!! 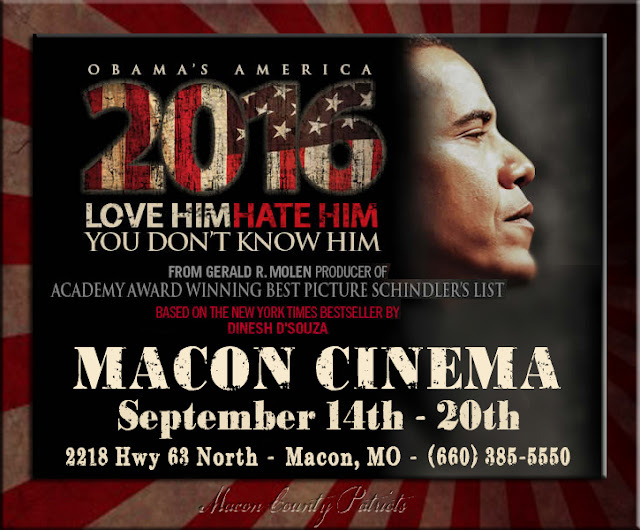 to the Macon Cinema showing of 2016.
will be the winners of the tickets. If you have friends or family who have any doubts, please bring them to see 2016. 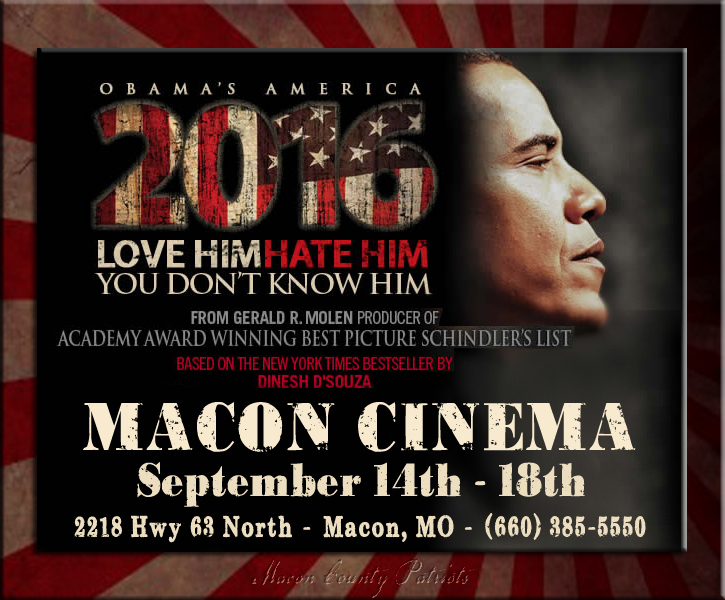 It's time for an awakening and this movie will open the conversation. While my look at he principles in the Declaration has touched on the high points, and there are others that could be mentioned, I will move on now to the Constitution. The week of September 17-23 of each year has been designated by Congress as "Constitution Week" and this year I am making it my "project" for that occasion to re-memorize the preamble to that wonderful document. And I will also go over that here as I continue to highlight our Founding Principles. "We the People" makes reference to the only legitimate authority, "the consent of the governed". "A more perfect union" refers to the fact that the governing authority in place at the time, The Articles of Confederation" were woefully inadequate for the governance of the nation. "...establish Justice, insure domestic Tranquility, provide for the common defence, promote the general Welfare" all make reference to legitimate functions of government and are a foreshadowing of the enumerated powers later spelled out in the Constitution itself. To "...secure the Blessings of Liberty to ourselves and our Posterity", refers back, and is consistent with, the principle of the purpose of government being to secure the inalienable rights of the governed. That's all for now, but I would encourage everyone to read, reflect on and even re-memorize the preamble. Doing so can help us in our "liberty evangelism". Never, never, never, never, never give up!